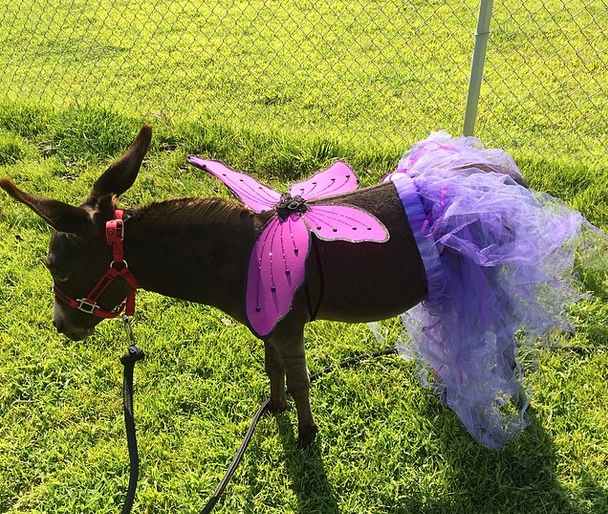 Jethro is seriously up for anything — be it being brushed and cuddled with, getting dressed up as a fairy, or going on a fierce adventure through the elements. Allow me to tell the greatly exaggerated story of Jethro's Journey. It started out as a normal walk, and we kept to the trails as usual. But alas, typical routines are boring, so we decided to go off the beaten path. We ended up in a deep, dark, heavily wooded forest. Despite getting lost, Jethro bravely marched through the thick underbrush without a care in the world. We came to a ditch that had to be crossed and stairs that had to be walked up, and the brave little donkey did just that. Suddenly, we realized that the stairs went off to Lala Land and we fell ran down a steep, grassy slope. As we were running uncontrollably down the hill (read: Jethro was galloping and bucking about and I was getting dragged by the 100 pound beast), it struck me that at the bottom there was a 10' cliff that ended in jagged rocks before becoming a raging river. Whoopsie. I slammed on the brakes and with all my strength reeled in the dreadful donkey. We charged up the hill (read: Jethro galloped and bucked about up the hill while I was getting dragged) only to find ourselves in the middle of a lush field. 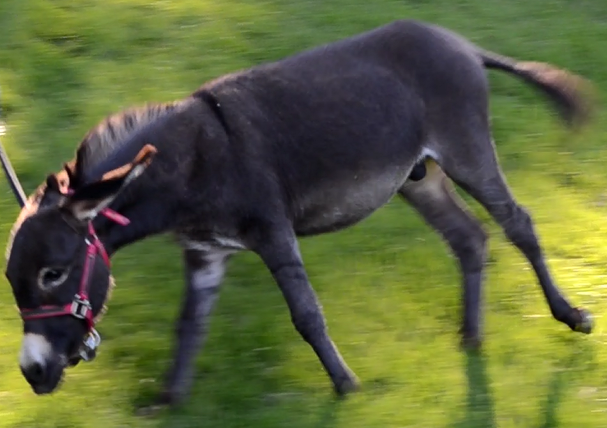 The little donkey was shocked and dove right into the grass. But then the human made him go home and the donkey became dreadful once again. Really, it is no lie that Ypke was awesome at fair as far as riding goes. That said, there was one huge tad issue though that posed a threat to the general public's safety — she refused to enter the barn. I can't say I blame her — the barns were HOT even with all of the fans, and she had never been stalled for a week straight before. In true Ypke manner, she adamantly refused to do something she didn't want to do. 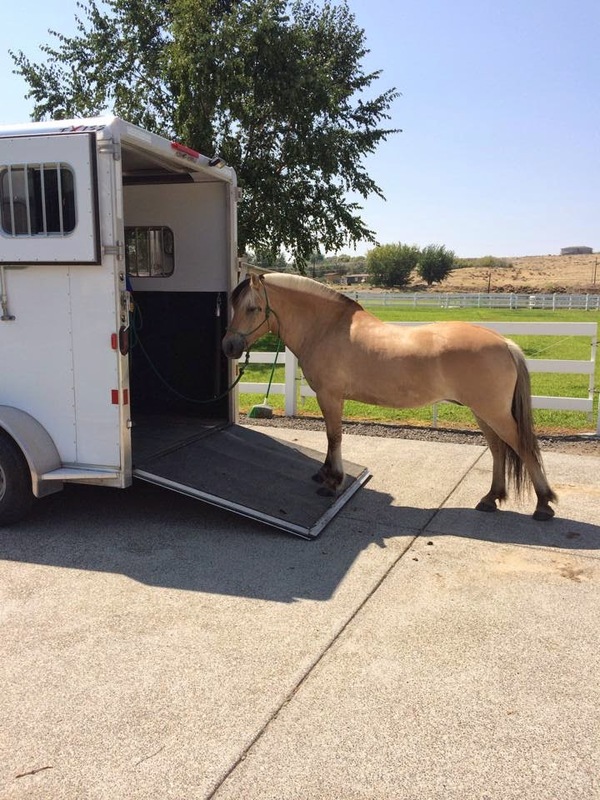 Seeing as how we were constantly taking her in and out of the barn, we had a problem on our hands. Throughout the years of owning Ypke, I have found that she is a very intelligent beastie who senses patterns easily and knows how to put two and two together. This proved to a be a problem when all 1100lbs. of her decided to go barreling back 30 feet into a sea of people... all in an effort to avoid the dreaded toaster. First we did a simple trick: having her follow a steady eddy horse nose-to-tail. It worked...once. Then the madness of her flying back happened. Then THEY came, like vultures swooping in to devour some sorry animal. By "they," I mean the people who think they are God's greatest gift to man kind — the wannabe trainers who get all up in your face with their "training" advice. "Have you tried having her follow another horse?" "Have you tried lunging her when she doesn't go in?" "Have you tried backing her in?" "If nobody was around, I would give her a beating she would remember." "Have you tried a stud chain?" "Don't let her back, PULL!" 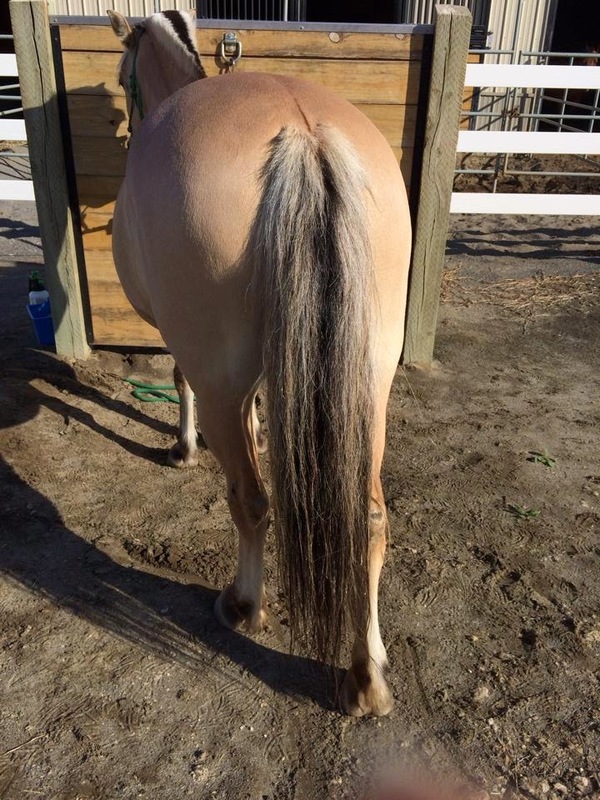 Hahaha, like I can out-muscle a Fjord of all horses. "You will never get her in." "You aren't being tough enough with her." To up the ante, there was constantly children surging up behind Ypke wanting to meet the horse from Frozen. The inattentiveness of some parents never ceases to amaze me.Yes, let your kids try to run underneath a misbehaving horse! Great idea! Then, of course, there were some snobs standing around, enjoying us struggling to get her in the barn. Fun! Luckily my 4-H group is awesome, and they really did help us out a lot. After a while, someone brought out this epic sweet feed that is practically like crack for horses, and Ypke waltzed right into the barn. She wouldn't go in for her usual grain, peppermint treats, carrots, apples, or hay. However, she was willing to sell her soul for this mystical brand of sweet feed. Yup, I found out the source and proceeded to stock up on our own supply!